Researchers are often frustrated by brick walls and remaining gaps in family history, but we also love to hear about colleagues who have made considerable progress and to share their success. Some 15 years ago, Tracing the Tribe was looking for relatives from Mogilev, who had settled in Detroit, Michigan. The strategy included sending out, via snail mail, a stack of letters to those with the same or similar names. The letter explained why I was looking for those family members and included my contact information. I received quite a few answers. My favorite response: “I’m not a member of that family, but I do know them. Here’s their contact information.” While some may consider this strategy a long shot – only one good response is needed to find those whom you seek. The Jewish Genealogical Society of Palm Beach County – celebrating its 19th year – will hold its annual SOS (“Share Our Success”) membership meeting on Wednesday, May 12. The day runs from 12.30-3pm at the South County Civic Center in Delray Beach. The agenda includes a Brick Wall Session, election and installation of officers and the main program starts at 1pm. Dr. Gary Stone will give a PowerPoint presentation “Barney’s Story,” a moving narrative of a family member who was responsible for bringing most of his family (more than 50 persons) to the USA. Dorothy Bernstein will share her research success finding family members despite the many changes in the spelling of the family name. Her persistence in searching for vital records enabled her to discover the various spellings were actually in the same family. Glenn Segal will discuss how to make successful research contacts through phoning. The annual program provides a wealth of genealogical research information. It is always one of the most popular events of the year. Q&A follows the presentations; members are invited to discuss their own success stories. For more information on the program, or to submit questions for the Brick Wall discussion, e-mail program chair Helene Seaman. “Googling Goodies for Genealogists” will be presented by Paul L. Enchelmayer at the next meeting of the Jewish Genealogical Society of Broward County (Ft. Lauderdale, Florida), in conjunction with Nova Southeastern University (NSU), on Sunday, April 25. The free program begins at 1pm at NSU’s Alvin Sherman Library, 3100 Ray Ferrero Jr. Blvd, Davie. Enchelmayer has spoken to nearly two dozen societies and clubs, presenting programs to help others learn how technology can aid in family history projects. He is chair of the Genealogy Group, University Club, Winter Park; past president and current webmaster, Central Florida Genealogical Society, Orange County; member and webmaster, Florida State Genealogical Society’s Speakers Bureau; member, National Genealogical Society; and member, Hamilton County Genealogical Society, Cincinnati, Ohio. Seating is limited, pre-registration required, so click here to let them know you’re coming. For more information, click on the JGSBC site, or send an email. A link on the JGSBC site will lead to the library site, with a map and directions. As Tracing the Tribe has often said, genealogy is the great equalizer. It crosses all boundaries of faith, ethnicity, cultures and other issues that might divide us. Genealogy doesn’t care what you eat, how or when; what you wear on your head or not; or any other issues that often separate communities and cause tension within even similar communities. All of us are joined by our common interest in learn more about our ancestors and our unique family history. The Internet can also be considered a great equalizer, and an online computer research forum sponsored by the Jewish Genealogical Society of Greater Orlando will help to break down brick walls, on Tuesday, April 27. The program begins at 1pm in the main social hall of the Congregation of Reform Judaism, 928 Malone Drive. The focus will be on breaking through brick walls, aided by five experienced computer genealogists – Herb Adler, Irwin Feldman, Paul Enchelmayer, Larry Morrell and Jose Valle – who will attempt to resolve difficult problems by demonstrating online techniques. JGGO program chair Jerry Kurland established a working committee in early February to set up the Forum, with Carl Migden as a special advisor. Kurland surveyed society members and requested that they submit their major stumbling blocks. — A member cannot find any trace of his great-grandfather despite the fact that he died in 1898 and is buried in Oak Woods Cemetery, Chicago. — A member is looking for the date and port of entry of his parents from Austria. — A third person had been trying for years to find his mother-in-law on a passenger list. Kurland says that the forum should provide some successful results and that, as a result, researchers should become more comfortable in browing the Internet and sampling websites from home. Society members and guests will be able to view a large screen projection on how to connect to various websites. For more information, address, directions, visit the JGSGO site. Genealogy beyond the Internet is the program at the next meeting of the Jewish Genealogical Society of Palm Beach County on Wednesday, April 14. The meeting runs from 12.30-3pm, with a brick wall session, business meeting and main program, at the South County Civic Center, Delray Beach. Members are free; others, $5. SIG groups for Hungary and Ukraine will meet from 11.30am-12.15pm. Mark Jacobson, Jerry Naditch and Dennis Rice will present the main program, as they discuss genealogy resources not generally available online. Researchers tend to forget that genealogists discovered useful sources of information well before the internet existed! The presentation will focus on several “hard copy” resources such as: vital records, grave markers, published obituaries, city directories and Social Security applications. The speakers will demonstrate examples of source material; how and where to obtain it. They will review resources of the Family History Centers (FHC), sponsored by the Mormon Church. Many valuable genealogical documents are available only on microfilm, which can often be ordered and read at the Boca Raton Family History Library and other Palm Beach County sites. Submit questions in advance for the Brick Wall program. For more information, visit the JGS of Palm Beach County. 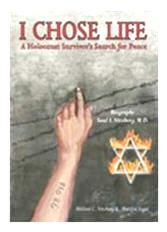 Author Mildred Nitzberg – “I Chose Life” – is the speaker at the JGS of Greater Miami’s meeting on Sunday, April 4. The meeting begins at 10am at the Greater Miami Jewish Federation, 4200 Biscayne Boulevard, Miami. Nitzberg’s riveting story is about her husband who survived Auschwitz and the Holocaust and his 33-year search to find his missing brother. It also describes how her husband experienced a world of unmitigated evil and yet emerged with his sense of humanity intact. Nitzberg has been collecting oral histories of survivors for many years, and has spoken to other JGSs, the Miami Book Fair and Meet the Author at the Holocaust Center in Hollywood. For more information please see her website. If available, David Hirschorn will also be here to discuss the latest on Yad Vashem. He is also very involved with Pages of Testimony. Guests and friends are always welcome. There is no admission fee. You don’t have to be Italian to be in the Italian Genealogy Group’s database! John Martino, a founder of the Italian Genealogy Group (IGG), will speak on just that topic at the next meeting of the Jewish Genealogical Society of Palm Beach County (JGSPBC) on Sunday, March 7. The JGSPBC’s annual “Lunch and Learn” is set for 11.30-3pm, at the Crown Plaza Hotel, West Palm Beach. Now IGG vice president and Special Project Coordinator, John has received an award from the Jewish Genealogical Society of New York (JSNY), and ItalianGen also received the Malcolm Stern Award from the IAJGS for its work in developing research databases. Tracing the Tribe remembers the excellent talk John gave at the IAJGS annual conference (New York 2006), where his society received the Stern Award. John will discuss how his 1,200 worldwide volunteers – of all ethnicities and religions – have created a variety of databases in New York and New Jersey, and how the same can be done in Boston, Detroit , Philadelphia Chicago and elsewhere. He’ll address the many naturalization records, and county, federal, and NYC vital records now in the IGG databases that have helped many genealogists in the US and around the world, how to use these databases and how they were created. The information contained includes data for Jewish genealogists not found elsewhere. Tracing the Tribe has found many items of value for her New York-based families in IGG’s resources. IGG was organized in 1990 and John was one of its founders. He has visited Italy twice and has traced his family back to 1572. Since he retired in 2000, he hs devoted most of his time to organizing volunteers to create databases. He first helped the JGSNY with Kings County naturalizations, followed by Suffolk, Nassau and Bronx counties. The federal records came next, including the Southern District Naturalization and now he’s working on the Eastern District. Brian Anderson, Department of Records and Information Services commissioner, asked John to computerize the Municipal Archives’ vital records. John and the IGG team have computerized New York City’s death records (1891-1929) and the Groom Index (1895-1936). Fee: members, $25; others, $30. Free valet parking. Reservations required by February 27. See the Jewish Genealogical Society of Palm Beach County website for information and reservations.